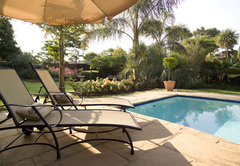 Royal Ridge Guesthouse is a guest house with self catering option, providing accommodation in Waterkloof Ridge for tourists visiting the Pretoria region. 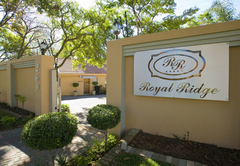 Royal Ridge is an exclusive 5 star Guest House situated in the tranquil surroundings of Waterkloof Ridge. 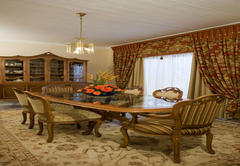 The guest house offers luxurious accommodation for the business executive and the sophisticated traveler. 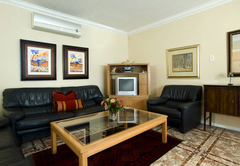 We offer Bed and Breakfast accommodation in four rooms and two self catering suites. All units have been decorated with flair and elegance and display stylish furnishings and decorations. All units offer cotton percale linen, velour bathrobes, hairdryers and toiletries to welcome the guests. This is a spacious room furnished with King size bed. 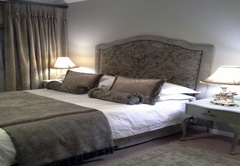 The room has a private entrance from the garden and there is an en-suite bathroom with bath and separate shower. Tea and coffee making facilities and bar fridge are provided. This room can also be used as a family room. 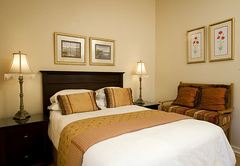 It is furnished with a Queen size bed and an additional room has a single bed. There is a private entrance from the garden. Tea and coffee making facilities and bar fridge are provided. This room has a double bed and a private bathroom with a shower is across the passage. 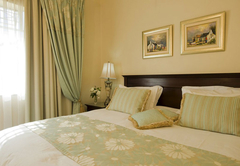 Room 2 is furnished with a Queen size bed and has a full bathroom with bath and separate shower. Rooms 1 and 2 are ideal for a family, friends or colleagues. They are located next to a private lounge with a table where they can work together. 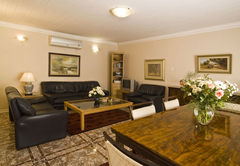 This is a one bedroom suite with a separate lounge, fully equipped kitchen and bathroom. This is a two bedroom suite with a separate lounge / dining room, fully equipped kitchen and two bathrooms as well as a private patio looking onto the beautiful garden. Self-Catering Unit with Private entrance to the Unit. 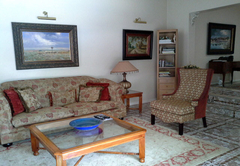 Luxury 1 Double bedroom Apartment,; with a separate lounge with DSTV, fully equipped kitchen and bathroom. The Lavender Room is also our Honeymoon Suite. 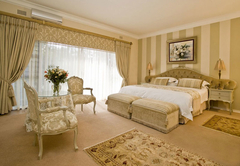 Luxury spacious en-suite room with a King size bed and a private entrance from the garden. 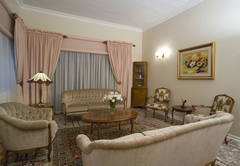 The Rose Room is also a family room with two sleeping areas. A Queen bed and a single bed. Private entrance from the garden. A Luxury Self-Catering Unit with 2 bedrooms and 2 bathrooms, Lounge / dining room and a fully equipped kitchen as well as a private patio looking onto our beautiful rose garden. This unit is ideal for the longer stay. Free Wi-Fi included. Double room in the guest house with double bed. Can also use as a family Unit together with Room 2. 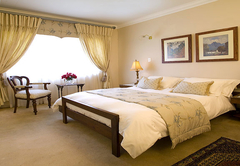 Room 2 is situated in the Guest House with double bed and full bathroom. (bath and separate shower). Room 1 and 2 is a safe haven and is ideal also as a family unit or for colleagues. Response timeRoyal Ridge Guesthouse typically responds to requests in 5-10 minutes.